Once upon a time in ancient times there lived a young man named Galoran . He was among those who respected for his parents wealth and rank . However Galoran very lazy and wasteful . Day-to- day work only squander possessions parents , even when his parents died he more often dissipate. Therefore, over time the parents are finished treasure . However do not make a conscious Galoran too , even time spent with just laze around and walk around . Iba villagers see it . But every time someone offers him a job , Galoran just eat and sleep alone without going to do the work. But eventually galoran levied by a wealthy widow to be his friend . This makes Galoran very happy ; " Shoots beloved side dish arrived " , so thought Galoran . The widow has a daughter who is very diligent and clever weaving , Jambean name . Jambean woven so well known throughout the village up . However Galoran stepson hated it , because often scolds Jambean always lazy . Galoran hatred so deep , to bear its own planned the murder of his stepson . Sharply he said to his wife : " Hi , Nyai , really dare Jambean me . Dare he advised parents ! Shall it ? " " Patience , Brother . Jambean not mean bad against brother ' cajoled his wife . " I know why he acts rude to me , so I'm going to leave this house ! " melototkan her again as she cried her eyes . " Do not be so kak , Jambean sister just reminded that want to work " according to his wife attempt to relieve his anger . " Ah .. crap . Anyway now you have to choose .. me or your son ! " Thus Galoran threatening . Jambean distressed mother . The mother cried day and night because her confused . She wailed : " To be your father abused me jambean . Jambean my son , let's come here boy " she cried softly . "I'll mak , stay slight weaving " replied Jambean . " Well done already " he cried again . Jump Jambean get his mother who is grieving . " Why Ma grieve alone ," he asked with compassion . Then diceritakanlah plan Jambean father who plans to kill Jambean . Jambean sadly , he said: " Never mind mak do not get upset , let me meet the wishes of the father . Truth will finally be happy mak " . " But my message is only one mother , if I had killed my father planted my body but do not throw it to the dam " he replied . With a very sad mother was nodding . Jambean was eventually killed by his stepfather and mother Jambean demand dumped his body in the dam . With magical torso and head Jambean turned into shrimp and snails , or also called snail in Javanese language. In the village of widows Dadapan two brothers named mBok Sambega Rondo and Rondo mBok Sembadil . Both the widow was living with a very needy and earns a meager living collecting wood and taro leaves . One day the brothers went to close the dam to look for taro leaves . Very stunned they saw shrimp and snails are golden brown . " How beautiful shrimp and snails was " exciting mBok Rondo Sambega " Look how beautiful the color of his skin , golden yellow . Want me to keep " he cried again . " Well so beautiful , we just bring it home shrimp and snails " said Rondo mBok Sembadil . Then picked up the shrimp and snails to take home . The shrimp and snails then they put them in a clay jar in the kitchen . Since they maintain the golden shrimp and snails they also life changing . Especially every after returning to work , the kitchen has available side dishes and the house to be very neat and clean . Mbok Sambega Rondo and Rondo mBok Sembadil also feel amazed with the things. Until one day they plan to find out who the hell do these things . One day they went to look for the usual wood and taro leaves , they pretend to leave and then after walking some distance they slip right back into the kitchen . From the kitchen came the sound of rustling , the brothers soon peek and see a gorgeous girl out of clay jars containing shrimp and Keong Emas their pet . "Of course he is the incarnation of the golden snail and shrimp " whispered mBok Sambega to mBok Rondo Rondo Sembadil . "Let's catch before it was transformed back into a prawn and Keong Emas " whispered mBok Sembadil Rondo . Slowly they entered the kitchen , and the arrest of the girl who is cool to cook it . " Tell me quickly nak , who the hell you were" urged mBok Rondo Sambega " Bidadarikah you ? " he said again . " not Mak , my man that was murdered and dumped by my parents , then I transformed into shrimp and snails " Jambean said softly . " Jambean moved to hear the story the two brothers finally take Keong Emas as their foster child . since the Keong Emas helped the brothers with the weave . weave very beautiful and nice so terkenallah stretcher woven throughout the country , and two brothers widow became increasingly wealthy of the day to day . The woven arrived in the capital of the kingdom . The young king was very interested in artificial woven Jambean or the Golden Snail . Finally the king decided to review its own manufacture woven and left the kingdom in the guise of cloth merchants . Finally the king knew about the Golden Conch , and is excited by the beauty and craft Keong Emas . 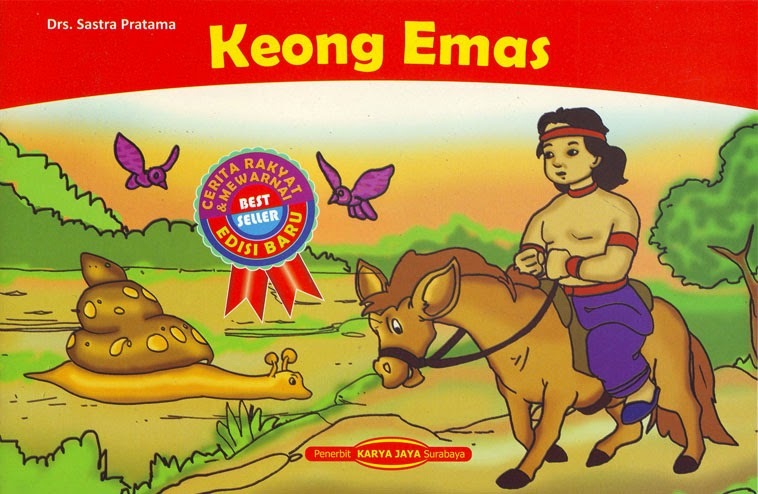 The king commissioned the brothers to bring Jambean or Keong Emas to go to the kingdom and to woo the Golden Snail to be queen . How happy the two brothers widow .